At the start of the 15th Century, Spain entered its Siglo de Oro, or Golden Age. The country had not only been recently united with the fall of Granada in 1490, but had also grown spectacularly wealthy after Columbus’ voyage to the New World and the subsequent founding of the first transatlantic European colonial empire. This new economic and political power led to increasing patronage of the arts and masterpieces were therefore produced in several areas. Throughout this Golden Age, El Greco helped create a uniquely Spanish style of painting, composers such as Tomás Luis de Victoria and Cristóbal de Morales helped to shape Renaissance music, Miguel de Cervantes wrote the world’s first modern novel with Don Quijote, and on the stage Lope de Vega and Calderón de la Barca perfected a new form of play in the comedia, writing several hundred plays between them. This period of intense artistic and literary creativity in Spain is, naturally, well documented in the collections of the Taylor Institution Library. Students of the Spanish Golden Age, however, may not know that the library is fortunate enough to possess not only a large amount of scholarship on this period of history, but also several early editions of works by the most celebrated authors and playwrights of the era. This blog post aims to highlight the richness of the Taylorian’s holdings from this period and also to provide a brief introduction to one book: ‘El parte veynte de las comedias de Lope de Vega Carpio’ (Shelfmark 270.G.20). 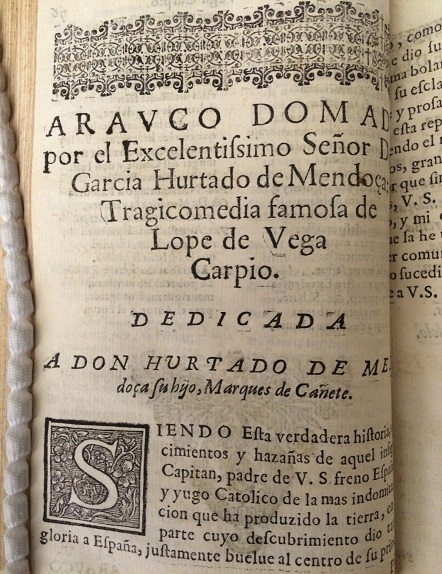 This book, published in 1630, contains a collection of plays written by perhaps the most famous Spanish playwright, Lope Félix de Vega Carpio. Born in 1562 and described by his contemporary Cervantes as ‘un…ingenio de estos reinos’ [a genius of these kingdoms] (Thacker, 2007: 26), Lope de Vega certainly led an extraordinary life. As Ignacio Arellano and Carlos Mata (2011) point out, he married twice and had several long standing extra-marital affairs before ending his life as a priest. Despite this religious conversion, however, his final years were not to be happy. After several personal tragedies and the loss of his favourite son and second wife in childbirth, one of the greatest Spanish authors of the period died in what Arellano and Mata (2011: 158) aptly describe as ‘cansancio y…soledad’ [fatigue and loneliness] in 1612 . Lope, however, was not only extraordinary in terms of his life experiences, but also in terms of his literary innovation. The playwright essentially revolutionised theatre in Spain, creating and defining the comedia nueva in his artistic manifesto El Arte nuevo de hacer comedias en este tiempo (1609). This new form of play was, as Thacker (2002: 7) points out, ‘a hybrid form of popular theatre’ that was defined by a mixture of tragedy and comedy. Normally consisting of three equal length acts, the genre proved to be extremely popular in Spain and scholars now attribute 600-800 individual works to Lope de Vega alone. This twentieth part of the comedias may only contain 12 plays from this impressive number attributed to the playwright, but they nevertheless demonstrate the range of the genre. This can be emphasised by a short analysis of just one of the comedias in this collection, Arauco Domado (1625). In this play, Lope de Vega dramatizes the conflict between the Spanish settlers and the Mapuche people in the territory that is now Chile, depicting an expanding Spanish-speaking world. The work begins with the arrival of García Hurtado de Mendoza to Chile, the viceroy of Peru from 1590-96, and describes the subsequent conflict between him and Caupolicán, the military leader of the Mapuches. Interestingly, the narrative shows a native perspective of the conflict, with Lope describing in detail the relationship between Caupolicán and his wife Fresia. After several battles between the two leaders, Caupolicán is captured by the Spanish and sentenced to death. As his capture dishonours him, his wife Fresia ends the play by throwing their baby son at his feet and killing him. In this play, Lope therefore takes the classic comedia theme of honour, but transfers it to the New World, introducing a native voice in the process. This play, however, is significant not only for its content, but also for its publication history as it demonstrates increasing communication, and conflict, among Spanish Golden Age writers. This is because Lope’s Arauco Domado is actually a dramatic version of an epic poem of the same name written by Pedro de Oña. Considered the first poet of Chile, de Oña wrote his version of Arauco Domado in 1596 for its protagonist, García Hurtado de Mendoza. As de Oña was commissioned by Hurtado de Mendoza, it naturally presents him in a positive light and, as reflected in Lope’s later work, his adversary Caupolicán negatively. Written completely in Spanish and avoiding any reference to native terminology, this work is therefore a deliberate attempt to defend Hurtado de Mendoza’s reputation: one that had been seriously damaged following the publication of another important Golden Age work, La Araucana, written by Alonso de Ercilla and published in three parts between 1569 and 1589. As Ercilla was condemned to death by Hurtado de Mendoza in 1558, La Araucana naturally presents this conflict in a completely different way to de Oña and Lope de Vega. Hurtado de Mendoza is, instead, vilified and the Mapuche are portrayed as a noble people defending their homeland against foreign aggression, an idea encapsulated in the portrayal of Caupolicán not as a coward, but as a brave chieftain compared to classical heroes. This comedia, therefore, is a useful resource not only because of the way it portrays Spain and the New World , but also because it shows increasing communication among Spanish Golden Age writers and their differing representations of the same historical events..
Also of note in this volume are the three aprobaciones [endorsements] that appear at the start. As the Inquisition wanted to impede the spread of heretical ideas in Early Modern Spain, books had to be endorsed by both secular and religious authorities, and this volume is no exception. Juana de José Prades (1971: 114) points out that Lope de Vega may have emphasised the importance of ‘libertad absoluta para el dramaturgo en la elección de temas’ [absolute freedom for the playwright in the choice of topic] in his Arte Nuevo de Hacer Comedias en este tiempo, but the inclusion of these three aprobaciones demonstrates that this freedom was constrained by both the Church and the monarchy. In the first aprobación, for example, the plays are declared to support ‘la piedad de la Fé’ [the piety of the faith]; in the second, the approval of the ‘Real Consejo’ [Regal Council] is emphasized; and, in the final one, the fact that the book ‘no contiene cosa contra nuestra Santa Fe’ [does not contain anything against our holy faith] is equally highlighted. Arauco Domado and the history behind it may reveal both communication and disagreement among writers of this period, but the three aprobaciones at the start of the volume reveal that freedom of expression certainly had its limitations. 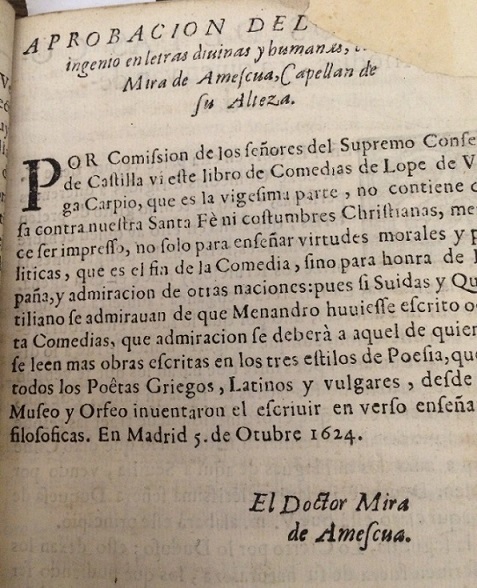 Although this volume may not contain the best-known of Lope de Vega’s comedias, it is not only interesting for the content of the plays included, but also as an object in itself, revealing much about the Spanish-speaking world and the political nature of book publishing throughout the Spanish Golden Age. This blog post has provided only a brief introduction to the collections available at the library, but Taylorian readers interested in the Spanish Golden Age can consult a variety of early works from the period. These range from other early works by Lope de Vega such as the Segunda parte de las comedias de Lope de Vega Carpio (Shelfmark: ARCH.8o.SP.1611) to early editions of Don Quijote by Cervantes from 1672-3 (Shelfmarks: BUTLER.CLARKE.O.4 and BUTLER.CLARKE.O.5) and an early volume of comedias by Lope’s successor, Pedro Calderón de la Barca from 1687 (Shelfmark: VET.SPAN.I.B.104 (v.3). 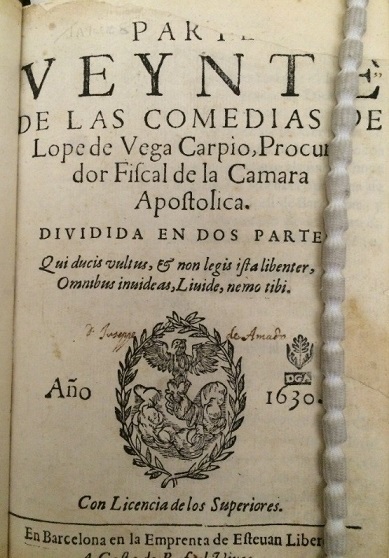 De Vega, Lope (1630), El parte veynte de las comedias de Lope de Vega, Barcelona: Esteuan Liberos. Arellano, Ignacio and Carlos Mata (2011), Vida y obra de Lope de Vega, Madrid: Homo Legens. De José Prades, Juana (1971), ‘Estudio Preliminar’ in Lope de Vega, Arte nuevo de hacer comedias, Madrid: Consejo Superior de Investigaciones Científicas, pp. 1-278. Thacker, Jonathan (2002), Role-Play and the World as Stage in the Comedia, Liverpool: Liverpool University Press. Thacker, Jonathan (2007), A Companion to Golden Age Theatre, Woodbridge: Boydell & Brewer. This entry was posted in Special Collections and tagged Lope de Vega, Siglo de Oro, Spanish Golden Age on 27 January 2017 by Clare Hills-Nova.